I remember the other occasions that I gave clothes away when I looked at this outfit and I thought: “I am going to use it. The perfect time for using it will present itself.” Of course that time never came. But I could not accept that I had done this, that I bought something and had not worn it. Not one single time. I get hand-me-downs from time to time and I don’t wear the clothes because I don’t like them, I just pass them on. But I did not choose those clothes. I did not go to a store, try them on and buy them. They came for free and the same way went. On January, 11, 2013, I was trying to do a challenge, like Steve did, and was assembling 100 objects to declutter. And I opened the place in my wardrobe where the outfit was. I was with a trusted person, who helps me with housekeeping and babysitting when needed, and she said I should let it go, because in three years she had never seen me wear it. I did not try it on to see if it still fitted, I just let it go. Why did I hold on to that outfit for so long? Because, as Colleen has put again and again on this blog, I could not accept defeat. I could not accept that I did not like the outfit, that buying it was a mistake and that it was simply not my style and I would never wear it, no matter how long I held on to it. I learned my lesson. But it took me too long and I agonized too much over it. Don’t let clutter agonize you, if you have something that you never wore, never used and are just hanging on because the day will come when you use it, give it up, that day will never come. Even if you think, as I did briefly, that there could come a Contry Theme party and I would miss that outfit and would want to wear it, I reminded myself that two such occasions did present themselves in 2012 and I did not wear that outfit. I chose something else. And the outfit had been there, at my disposal, in my wardrobe. So I let it go. Trust me, give up whatever you are not using, you will not need it and the occasion will never rise, I waited 10 years and that “perfect occasion” to use it never came. Saturday – If you haven’t taken a look at your collection of books for a while now is as good a time as any. If you are inclined, reduce the number a little more. Question your sentimental attachment to books you have already read and aren’t likely to read again. Sunday – Sunday is reserved for contemplating one particular item of your choice that is proving difficult for you to declutter. Whether that be for sentimental reasons, practical reasons, because the task is laborious or simply unpleasant, or because the items removal requires the cooperation of another person. That last category may mean that the item belongs to someone else who has to give their approval, it could also mean there is a joint decision to be made or it could mean that the task of removing it requires assistance from someone else. There is no need to act on this contemplation immediately, it is more about formulating a plan to act upon or simply making a decision one way or another. Wow – thanks for this. I am so relieved to hear there are folks out there who feel the same way I do. I held on to an evening gown that I paid good money for to attend a particular event. Plans changed. I held on to the gown for over four years. I admitted defeat that it was never going to be worn by me and I donated it with the price tag still on it. Andreia, this is a good post. This is so true and not just of clothes. We have had things we have moved around the country for 20 or more years that were never used. Finally, just recently they were let go out the door. What a relief. Michelle, I know what you mean about going to the recycling center. When I make a trip to ours or go to the battered women thrift shop I give most things to I feel really good. 10 years, 20 years … sometimes it is good to speak out those numbers, isn’t it? It makes it a bit clearer how ridiculous we all are at times. I just let go of some art (clay sculptures) I made in highschool more than 15 years ago. I was proud of them back then, got a good grade for them and actually still thought of them as good when they resurfaced two weeks ago. But the truth was: They were depicting subjects I did not want to display, neither then nor now nor was there a chance I would love to look at them constantly some time in the future. And still I really needed to put it into my head that they had lived in a box for more than FIFTEEN YEARS and that there were other ways to remind me of my art class successes than lugging around a big and heavy box of clay pieces. Hi Ideealistin! That is exactly why I wrote this post. I did not like that outfit, but because I chose to buy it I could not admit to myself I would never, ever wear it. It is not my style. It never was. It was aspiring clutter. Your clay sculptures served you when the need arose (good grades) and should be long gone. But we hang to some of these things in need to remember those times, or just because, when we put it away we imagine that, one day, we will display/wear/appreciate it more, but when the time came and you really don’t care about it at all, it is still hard to let go. Good for you for also having let go of an unused and unloved item in your home. Hi Deb J! Yes, I did feel a freedom when I decided to let it go. It is a relief, as you put it, to open my wardrobe and not having that symbol of defeat staring at me. Andreia, thanks for sharing!! I cannot tell you how many of those outfits I have, though most of mine have been free. With 11 people in our family, decluttering clothing is a constant battle, especially with everyone changing sizes all the time. One other thing I finally realized in my decluttering efforts, I would save things that needed to be mended or fixed, or recovered because some day I was going to get around to doing that and when the time came, I wouldn’t have the money to replace it. I had saved 11 pair of pants which needed patches and three kids had grown in and out of those sizes. I finally thought, “Why am I saving all this work for myself?? No one has worn them and we have done just fine.” Then I let them go and most of the other broken, not functioning items. Whew! It is definitely a process, and for me, it has to happen over and over and over again!! Hi Carin! The “I will fix it when I have the time” also plagues my home from time to time. Unless we are talking about new outfits that just need adjustments, I think it is a waste of time keeping things to fix later. I have met people who are wizards with a sewing machine and can turn any piece of clothing into a beauty. Well, that is not me, so if I see that having clothes fixed is too expensive, I donate them and let whoever is taking them know that it has to fixed. It works for me. As for fixing my kids clothing, or have them fixed, we have to be extra quick, because if you leave them on a corner, for say 6 months, they don’t fit any more. So, you did a good job letting those broken and not functioning items go from your house. Keeping broken things adds to mental clutter because you keep thinking you should fix it and the item is not even worth the bother. This is an extremely helpful post! I am downsizing , when my large home sells I will be buying and moving to a smaller townhome. I am able to purge a zillion things very easily (I own too much) and out they go….but many things cause me to be stuck and I couldn’t figure out why. They are they things that are like Andreia’s outfit. I bought them and intended to use them or wear them but for a variety of reasons I don’t; yet I can’t let go. Many are things I “wanted” for a long time and purchased; the situations have changed so they don’t get used or they were never right in the first place. Many are “coveted’ items; which helps me see I need to face “coveting/wanting” thing more clearly, because I have a lot of things in this category. Andreia has nailed it and I am going to purge those things with this in mind. I love this blog….it helps me so much. I may begin to photograph those things as I very intentionally let them go. I’ve been there. That outfit that I just had to have because of how I felt in the store with it, then taking it home, the real occassion never comes. Thank you for sharing that. I think I have to go visit the beautiful, colourful, cropped knit jacket with the fleece liner that is oh so awesome – in theory – that I’ve never worn. Go get that jacket creative me! We are here to support you. I really must follow your example. There is a green and pink floral skirt in the drawer under my bed, bought in 2006. It was quite an expensive purchase for me. I was talked into it by a “friend” who was helping me to feel good about myself after a long illness. I never had a blouse, jacket or shoes that would go with it and I think I knew even as I bought it that I am not a flowery skirt and high heels sort of person. My friend said it would be lovely for a summer wedding or garden party – there has been no wedding and no garden party posh enough for me to teeter on heels! The skirt lives with a blue and white floral dress that was a bargain the following year and has also never been worn. I’ll be singing a Jim Reeves song as I open that drawer “and you can tell your friend there with you, he’ll have to go”!! Tracey, LOVE your reference to the Jim Reeves song! Tomorrow when I am working on some closets, I will have that song in my head! Thanks for this post, Andréia! Great that you let it go in the end! I am glad to able to help by sharing what is happening to me. And good luck in your declutter. I have done that with clothes too. Ugh! I realized this week that it is weirdly difficult for me to part with the rocks and shells I collected as a kid. They’re just rocks! But I remember how happy I was to find them, how I treasured the way the light hit them and illuminated certain colors. Partly I think there is the issue of: what do I do with this if I get rid of it? I don’t think the thrift store wants rocks. I put about 1/3rd of them outside, and the rest are at least on display as decoration for now. Rebecca – do you have a local Freecycle site to post items for collection? I am constantly amazed by what people actually want. Aside from that a local craft group? No ideas for the rocks Rebecca. I just shared my rocks (they were like rough crystals), started to give them away to friends and family, but I was a teen. I don’t know the size of your collection and you could, as Moni said, give them to craft groups to do something with them. I hope you find a solution. I just signed up with my local Freecycle, so I’ll try that out. It was surprisingly bureaucratic to get signed up, at least compared to craigslist. I do currently have most of the rocks in a vase on the table looking pretty, just trying to decide what to do with them after I get tired of that. Unfair! You are talking about my black dress. I love that dress. It is unique and floaty and every time I sort my clothes I bring it out and remind myself that I don’t have to wait to wear it. I’ve had it forever and it still makes me feel good to imagine myself wearing it. But you are right – I don’t. Use it or lose it – and you are a winner in the end (either of a “new” piece you actually love AND use – or of the epiphany that letting the piece go really isn’t as hard as you thought it would be). Hi Delores! Yes, I liked that phrase “I’ve had it forever and it still makes me feel good to imagine myself wearing it” and it is so true. The idea of wearing some clothes is a lot better or the opposite of really wearing it. So if you are just imagining yourself and not really wearing it, let the dress go! And as ideealistin put so nicely (and Colleen wrote a post about) Use it or lose it! It is hard to decide either way (wearing x letting go), but it will be for the best. Wonderful! Good for you, Andreia! This entire process of decluttering is about being honest. And, Andreia, you are honest about the fact that you know that you will never wear that outfit. I applaud you. Rebecca, Use the rocks in a glass vase or dish and put flowers in it as a decoration or put them in the bottom of a flower pot. They work very well to aid in drainage. If your pot is clear glass, you can still see them and make use of them at the same time. Andreia, as I read your note, I realized that I have a suit that I purchased in 2003 that is still hanging in the front closet that I have never worn. I bought it right after I got laid off and rehired by my same company in a different division. I had been in the hospital and knew that the size I was then was not my regular size but the suit was so beautiful and ON SALE. Still it was expensive. I brought it home and by the time I started my new job, it was too small. So, there it hangs. I may try it on now and if it doesn’t fit (I have lost 30 lbs since then), I will donate it and try to forget the money. I also have a little black dress that was made for me. A friend had a dress show for one of her neighbors who was just opening a clothing business where she made things to order. I bought the dress which is lovely but a clingy jersey. Since that time, I have had an ileostomy and because it is clingy, the ileostomy bag shows. So, it too, sits in the closet. Thanks for the reminder that not every choice is a good one. Guess we all have those “mistakes”. Now, I do have to decide what to do with my “mother of the bride” dress that I bought when I was 30 lbs heavier. I love it but it is way too big for me now. Perhaps someone is looking at GoodWill for just such a dress! Hi Maggie! I think what happens more often than not is that we change, we get older, change styles and we don’t let our wardrobe change with us. Probably, if you had not had a ileostomy the clingy jersey dress would look great on you. Or you might not want it because it did not suit you anymore. I think you should try your suit and if it is a classic cut and if it fits you, you should give it a try. You lost a lot of weight (congratulations on that! I know how hard is to lose even a miserable pound 🙁 …) so if a piece of clothing is to big it can be fitted by a seamstress. But before you spend good money, really and honestly access if you would wear that piece of clothing if it was your size. Andreia – what an AWESOME post! So proud of the progress you have made since you first popped up on 365, you’re like a completely new person. I like the way you put it – “admit defeat” – yes that exactly sums up what we feel we have to do. But in reality we are winning. Confession: I have an EIGHT year dress. Bought for my SIL’s 10 anniversary, and I looked really nice. It was too long for wearing anywhere casual and had beautiful inset panels on the skirt which I thought would be such a shame to lose if I had it cut shorter. I borrowed it to a couple of friends and wore it again myself about 3 years later and looked awful!!!! I’d commenced my yo-yo upwards weight that I am now bringing back under control. (Is it coincidence that my five years of acquiring clutter coincided with five years of weight gain) – but because it was so pretty I hung onto it as my daughters were growing girls and possibly they might want to make it over if they (a) still thought it was pretty and (b) what if I/they needed a special dress and couldn’t afford one or (c) what if I gave it to someone who didn’t think it was as special as I did? And all thru my decluttering I have kept this dress. So here’s the deal. I have lost a fair bit of weight recently and have been having something of a wardrobe shortage as I don’t want to buy Summer clothes when we only have Feb and March left of warm weather but the clothes I bought at the start of Summer don’t fit nicely any more. I will put it on tonight, if it isn’t as pretty as I remember, I will give it away. If I don’t fit it or if it doesn’t look good, I will give it away. If it does fit, I will take it to a seamstress friend on Monday and see if she can shorten it, if she can’t, I will give it away. If she can, I will have it shortened and wear it as much as possible this Summer. Andreia – LOL I should have clarified – the person in the dress looked awful. Namely, me! I was about a size too big (and had been thru a hell-ish two months so looked haggard and rather overdue for hair cut & dye) for it but thought we were going to a sit down formal dinner just for family at my sis-in-laws, so it would do as I hadn’t had the time nor spare cash to buy something else. OMG! It was a surprise party for our 15th anniversary, with all my friends looking fabulous and me looking dreadful. Oh Moni, how awful for you!!! I think someone in your family should have taken you out, given you a day at SPA, or at least made you fix your hair so at least you looked presentable. I, being known for having an awful temper and a dislike of surprises (having shared this here 😀 ), would just leave. I admire you for laughing it out. The dress will probably look as good as it did once, so use it until it wears out! Andreia – yes I’m not a fan of surprises but as I tell my kids, the worst events, the most embarressing events etc all end up being the best and funniest stories down the track. I tried on the dress, and it fits, my husband was impressed, however it doesn’t lend itself to being shortened, so it is official, it is leaving the house. My older daughter says it is nice but she is planning to sew her own Ball dress (Prom) so we should let it go. I also found a 5 year dress which I bought to go to the Napier Art Deco weekend but haven’t managed to actually go and as I won’t be going again this year, it will be leaving too. I’ve also remembered some 2 year shoes which are party shoes that I haven’t worn so I will get those down from the top of the wardrobe today too and make a decision. What is it with us women and clothing? 😉 I have a stunning dress that I have had for almost 17 years and I will never ever be slim enough to wear it again. I wore it one time. It makes no sense that this is wasting space in my closet. I am so glad I stumbled onto this site. Nobody I know talks about their struggles with these things and it is comforting to know that you all are here. We dream we will be slim like that once again and will wear that beautiful dress and look as gorgeous as we did when we were 18, 19, 20, 21, 23, 24 years old (when I graduated from college)…And it is not going to happen!!!! 😀 However, we can’t let it go, they live in our wardrobes as reminders of other times, younger times, long gone. I wrote this post because after a great struggle I let it go. It was not easy, but it had to be done. Good luck in your decluttering! Thank you for your post Andreia. You put it very eloquently and I love the statement about the clothes living in our wardrobes as reminders of other times. So so true. Or many of mine have become silent accusers of the money spent and the weight gained. About ten years ago I lost a lot of weight and bought a lot of clothes which I did enjoy wearing but gradually the weight crept back and the clothes just hung there. Now I realize that even if I could fit back into those things they would look dated and out of style and probably wrong for me as I am now, so I am finally donating them. I am also getting rid of clothes that were bought for me by my mother. I prefer to remember the happy times we spent together on those rare shopping trips rather than see the long-outdated clothes hanging there unworn. Way to go Christine! I am glad to help. Great post, Andréia! It rang especially true with me because I just donated a pretty floral sheath dress that I bought around 1999 or 2000 and never wore. It didn’t fit me in the shop but was close, and it was so pretty and at such a good sale price that I bought it anyway in the hopes I would diet into it despite having never been that size since I was 14 years old. Well, all these years later I still haven’t dieted into that size so it was time to say goodbye. If I ever do lose that much weight on purpose I’ll want to buy new fashionable clothes anyway. I hope somebody else enjoys my dress this summer. Hi Jenny! I might have done what you did back in 1999 or 2000, when I was skinny, getting skinnier by the day and all into buying very fitted clothes. I got fat. Getting fat and loosing most of one’s wardrobe and having no luck in any diets one may attempt, does making go shopping in just an adventure in finding a place that sells clothes that fit you AND are on sale or, at least, at an approachable price. And you are saying what I told my husband when he wanted to hold on to old jeans trousers that were 4 sizes too small: even if he did loose all the weight he said he would, he would not use old worn jeans, he was going to want new jeans. I am sure that dress will find someone that will use it a lot. Thank you for sharing such a powerful example of how we struggle to admit defeat. I am having the same feelings on some of my stuff. Thank you, Mark! I am glad my story helped. After I decided to donate the outfit I felt it could not be wasted and the post wrote itself in my head. Admitting defeat in this case made me feel free of the burden of wearing the outfit and the mental clutter it caused. Oh, I remembered a few skirts in my wardrobe (though one has been donated last autumn), that maybe fall into the same category. Somehow I seem to be a size every woman in my family had once been and somehow I ended up with long, elegant skirts from both my grannies and my mum. Though I like them, it’s not as if people wore a lot of long skirts nowadays, let alone that unlike with a dress you have to find something that goes with that skirt. I let go of a chocolate brown velvet skirt last autumn, when I finally realized that the only way I’d ever wear it would be some very fancy event in winter which I haven’t encountered yet. As even if I go to the opera or so I have my ( a little more casual, not THAT elegant) things to wear. Plus, I had nothing to go with it and also couldn’t really imagine what would go with it at all. Even though I really liked the fabric and skirt, I found reason and gave it away in the end. I hope some lady will wear it and feel grand. I still have the two other skirts, which are of a lighter material (one cotton and one artificial silk), so I can (in theory) imagine a variety of things to go with them and I will try this summer to find occassions to wear them. We’ll see, if I’ll be happy with them by autumn. Hi Sanna. Sometimes, when we get hand me downs the thing we must do is put them to use. It is the only way to know if those clothes fit with our lifestyle. As you have already donated one of the skirts you thought would not fit your lifestyle and are giving the others a try before you decide, I think you are in the right path with your clothes. Great post, Andreia. I loved your thoughts, they can be applied to many things when dealing with clutter, not just clothing. I certainly have some more pieces in my closet that could be donated and given the opportunity for someone else to use/enjoy. I think sometimes we treat, even clothing, like sentimental clutter. For women, maybe we remember that special event or even the times when we were skinnier and therefore felt great wearing something pretty, and we think that the memory will be gone once the outfit is gone. A few years back, I had lost a lot of weight and felt pretty good about myself and was given a lot of clothing from a relative. They were beautiful, vibrant, and colorful pieces. It was one of the few times in my life that I wore something other than black, white, beige, grey or another neutral shade. It made me feel pretty good to wear such colorful clothing. Over time though, the weight crept back up and so out the clothing went and I am back to neutrals. Letting go of those things was easy because, like you said, they were free. I have never been one to put a lot of emphasis on clothing, especially expensive clothing or brands, unless it was an investment piece like a coat. I wore a lot of hand-me-downs growing up and I spent years in a job in which I had to wear uniforms. Mostly, I buy off of the clearance rack or I judge pieces individually from racks, but I won’t spend over a certain amount. Nevertheless, I found an item or two in my closet that had the clearance tag still on it, also, some shoes that have not been worn yet. (I also need to consider those clothes in the bottom of my drawers that never seem to make it to the top of the drawer and are forgotten about.) I know it is time for me to let the dream go though, because even if I do get to the point that I wear them, they may no longer be in style or be my style when that time comes. I try to do better than this, but they say most people only wear 20% of their clothing 80% of the time. This was an interesting post, and the comments too. I wonder if anybody has held onto a piece of clothing as long as I have? I have a pair of pants from 1975–yes, 1975. I was very, very thin then, and the pants were my favorite bell bottoms (hee hee). I used to keep them because I used them as “motivation” pants–you know, I want to wear these again, so they’ll motivate me to get back down to that size. Well, the years have come and gone, and my weight and shape have changed so much that I will NEVER wear those pants again, no matter what I do, so now I need to figure out whether I want to continue to keep them or not. I’ve thought about making a grocery tote bag or something else useful out of the pants, but haven’t gotten around to it yet. I haven’t had one that long but I did have a sweatshirt that I had painted rabbits on from the late 70’s. I finally got rid of it (gave it away) about 6 months ago. It was too small but I had done such a good job with the rabbits. hard to let go of it. Deb J – I was BORN in the 70’s! I can remember mum sewing me a little outfit to go and see Grease at the movies, it was ORANGE and had a swing top and flared pants. I imagine it was very cute and she was a very clever sewer, but just by description alone I shudder. It is the earliest outfit I can remember. The next was the pink dress with ruffles down the front. To this day I don’t wear pink and am not keen on ruffles. Moni, I was worn in 1952 and graduated high school in 70. Mom was a pretty good seamstress but always made my clothes more along the line of what she liked rather than what I liked. I remember some things that horrified me but that I HAD to wear. Ugh! I certainly didn’t hang on to them. Deb J – I’m sure there is a therapy group out there someone all about mothers dressing their daughters! Moni, you are probably right. Grin. Ooooooh! 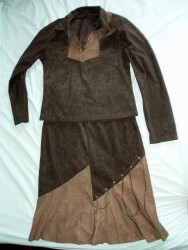 I just rememberd that my mom has this fantastic buckskin leather jacket with fringe and hand beading from mid-70’s(?). I love that jacket and yet I am far to broad in the shoulders to wear it. But I’ll bet you a vintage shop would pay good money for that. Some of those clothes were so cool. Michelle – my teenage daughters were looking at one in the shops at the end of winter last year. Becky – my MIL can top you. She has in their attic boxes of clothes dating back prior to her having her two sons that she planned (or plans?) to fit back into. My hubby was born in Jan 1971, so by my calculations they were early 1970 at the latest before she got pregnant and most likely late 60’s. She also has her mothers wedding dress which was pre World War 2. I was thinking back and we have my Mom’s one and only doll and on it is a dress Mom made for me when I was 1. She also still has some baby clothes from me and my brother. He is 63 and I am 60. Weird. Just weird. Hi Becky, I have an embroidered peasant blouse I made in 1973 and an embroidered hippy-ish top I made in 1974. Bet they’d both look really cool with your bell-bottoms. I’m a bit bell-bottomed myself now so neither would fit me! But they’d all go with the shoulder bag I wove in ’72. I don’t mind keeping a few pieces of ‘historical’ (more aptly ‘hysterical’) clothing. But the dress I bought 20 years ago and never wore went to the thrift store last week. I loved the peasant blouses we wore in the 70s! I don’t have any ancient clothing except maybe some I wear, but before Christmas took a dollhouse (to a consignment shop) that I bought to work on with my granddaughter who was then 6–I didn’t just give it to her since there was no one at her house who would be able or willing to help her put it together. Somehow her visits were too hurried and too far between for this to happen. She is now in her 20’s, and I finally realized I was never going to have the time to do it either. So it went along with some other aspirational clutter. I guess I felt guilty about not having done this with her, guilty about wasting the money, guilty about not passing it on to someone who could and would enjoy assembling the house and the furniture which came with it. But I feel very good when I see the empty space on the shelf. So we don’t have to let guilt get the upper hand, and we can toss the guilt out with the stuff attached. I would like to thank everyone who read this post and commented it. I really loved the feedback and it made me glad I told you the story of this outfit. 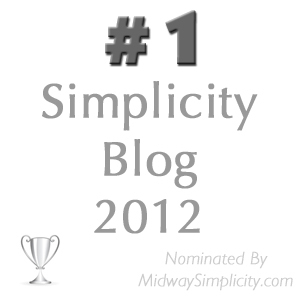 Great post, it fits me to the tee (no pun intended) I started my New Year’s Resolution the 11th of January this year. I have come to realize and accept that I am a shopaholic. I shop when I’m happy, I shop when I’m sad. I even have one area in my closet where I accumulate many of the new purchases I come home with every couple of days. I went through it to sort it out and after putting away the new make up, bathroom supplies, and taking off the tags to some of the clothes to put in the laundry basket I was left with half a dozen pieces for clothes that I regretted buying. I look at each of the receipts and they are all past the return and exchange policy. They are too “nice” to donate and I don’t have anyone that I can pass them to. On top of that, I’ve been losing my pregnancy weight slowly but steadily for the past year (47 pounds so far!) so I don’t even fit some of these clothes. Keeping them would mean I would have to invest more money into tailoring it to my size and still may not wear it. I thought enough was enough, something MUST change. I dedicated myself to a “Spending Fast” I will not buy anything “new”. For example, when my shampoo bottle (a necessity) is empty, I will purchase one to replace it. I can go grocery shopping for food (another necessity) but I can not buy a new shirt or jacket because its on sale or its “so cute I must have it!” It’s been SO hard but it is now the 3rd of February and I’m super proud to say that I’ve been keeping to my Spending Fast. I’m setting small goals first by trying to keep this up until my birthday in April. I may enjoy a day of birthday shopping then or I may not. At this rate, it gets easier and easier every day so when my birthday comes along I won’t be surprised if I can tack on the Fast for another 4 months etc. When will I be able to donate those sad 6 pieces of fabulous clothes that I regret purchasing? I’m not sure yet but ask me that last month and I would’ve answered, “I will wear it, just leave it there”. Jenny, we are proud of you and how well you are doing with your Spending Fast. It’s hard. I was never a shopper for clothes but I couldn’t go near a scrapbook shop without spending. I’m behind you on keeping it up. So glad you are able to do it and can see the benefits. Congratulations on sticking to your resolution and keep going! It’s really worth it! Good for you, Jenny. Why not start planning your birthday NOW. A hike in the woods, day at the beach, trip to a museum….anything but the mall. You’ll be able to afford to do something nice with all the money you haven’t wasted in the meantime, buying stuff you don’t want! Hi Jenny and Wow! What an amazing pledge. And what a fabulous success you have had so far. Shopping for the sake of shopping and not even using what you bring home is a good sign that it is time you did something about this. Going cold turkey is often the best way to quit doing anything that isn’t good for you. I would suggest that you don’t go on a shopping binge for your birthday. It sounds to me that giving this up ought to be a permanent situation and jumping off the wagon might just set you back down the path of old habits. Reserve your shopping for only when you need something. And just think how much you have also reduced your carbon footprint. You are therefore doing yourself a favour, the environment a favour and I am also sure that, as your children are young and impressionable, you are also doing them a favour by setting a better example on how to behave. I wish you every success for this challenge. Myself and your fellow 365ers are behind you all the way. Keep us informed on how you a doing, especially if you feel you need a bit of moral support. Jenny – I too was a shopaholic. I shopped ’cause I like clothes, I shopped when I was feeling unhappy, I shopped to buy things for my kids to show how much I loved them, I shopped cause I was bored……you get the picture. Through 365 I took part in a number of challenges that have changed me for the better permanently and I know I have a international cheering squad should I need some support. I still run into quandries, but it is brilliant being able to call on this community for input. Cold turkey works for me too. Rather than focusing on a big shopping splurge, why don’t you set yourself some limits? Rather than giving yourself free license to buy whatever you want, why not decide in advance what it is you really want, say, a new pair of jeans, 2 tops and 1 pair of shoes. You will figure out in advance exactly what you need to supplement your existing wardrobe and you will shop cautiously – just make sure that what you do buy, you absolutely love and fits great now! I am facing a complete new wardrobe for Autumn/Winter in March – but since I did Project 333 last year, I have continued to have a very small wardrobe and so I will be very cautious exactly what I put on my shopping list. PS – is this Jenny from Christchurch? I’d encourage the same thing. You can enjoy shopping while still sticking to your fast, by shopping mundane for necessities (or long-wished-for wants even). These days I’m making a huge thing out of my about-once-every-other-month-shopping of buying a new bra or a new skirt or even a new brand of tea. I go to a lot of shops and look for the perfect thing, maybe have a coffee out and do everything that made the whole shopping experience enjoyable, only that I don’t buy what comes to my mind, but only what I truly need or want (and wanted for quite some time so I know it is no fad) and sometimes I “go shopping” twice until I finally bring home that new thing. Colleen mentioned going cold turkey as a way to cure recreational shopping. That method WORKS. I wouldn’t want anybody to be “cured” the way I was, but I went through a nasty divorce in the 90s that left me destitute. WHAMMO! I went from having plenty of money, going shopping for recreation whenever I felt like it, to having no money, wondering how I’d put food on the table and keep my lights on. That period cured me of the shopping habit. To this day, I never shop recreationally any more, and it’s been probably 20 years since the last time I set foot in a mall, and I don’t even WANT to go to the mall now. To anyone who’s working on shopping less, good for you, and keep it up. The peace of mind you’ll get from being a non-shopper, or at least a much-less-often shopper is priceless. You’ll have less financial stress in these days of ever-increasing costs, and you won’t feel the guilt of buying and not using, over-buying, etc. Plus, it makes it much easier to keep your house decluttered because you just won’t have the volume of stuff coming in.